Never before has a shopping experience felt quite so much like robbing a corpse. It was just kind of depressing in the store, with all the cheaply-printed price signs and empty, picked-over shelves. Even the manager, who's usually a pretty chipper guy, was down in the dumps about it. Since moving to within a block of my local Blockbuster, I became a big fan. I enjoyed having a huge selection of movies available to me for just a dollar, and I didn't have to plan ahead like with Netflix. It wasn't always this way, though. 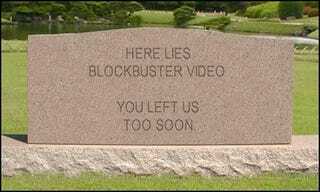 For most of my life, I've been terribly afraid of going to the video rental shop because I was afraid of the register jockeys judging me. My conversion to an old man who doesn't give a damn is probably a little premature, but it has increased the enjoyment I get out of life, so I guess it's a good thing. Also, my taste is impeccable (other than that time I rented "Real Steel"), so I'm not worried that much about it. Anyway, I know they aren't the world's favorite business, especially with how the squeezed out independent rental shops, but I enjoyed having a Blockbuster nearby, and I'll miss it now that it's gone, especially because they had some really nice people working there. I just hope that I can correct a glaring deficiency in my DVD collection and get all three Indiana Jones films.